- Camlin Charcoal Pencil pack contains 3 assorted hexagonal pencil grades - hard, medium and soft. - Best result can be seen on drawing paper, sketching papers, textured paper, smooth tinted paper or even on canvas. - These pencils offer rich black tone. - Camlin charcoal pencils are Artists quality. 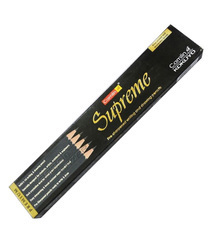 In order to cater the variegated demands of our clients, we are offering an excellent quality range of Camlin Supreme Pencil. Our company has set benchmark in offering Pencil. Keeping the diverse requirements of the customers in mind, our company is involved in offering superb quality range of Camlin Exam Pencil. We offer our clients an exclusive range of Camlin Pencil. - Available in a pack of 10 with Camlin Exam All Clear Eraser and Camlin Exam Sharpener Free.